Mikhail Aleshin has become the first man to conquer the polar circle by driving a race car solo on pure ice at a record speed of 228 kilometers per hour, thus marking a double Guinness Book record. The race took place on a completely frozen Lake Lovozero, which is located on the 67th northern parallel, according to Adrenaline Rush, the event’s organizers. Aleshin’s GP2 race car underwent special modification to suit the extreme weather conditions. As can be seen in the photos, the tires have enormous studs to prevent skidding. The motor’s cooling system was also taken into consideration, given that there wouldn’t be much heat in temperatures that don’t exceed -10 °C at this time of the year. The 28-year-old racer also had to wear additional gear to avoid being burnt by the ice while traveling at such speed in the freezing cold. Although technically this isn’t the first time a racer has braved the polar circle, Aleshin was the first to do it solo. 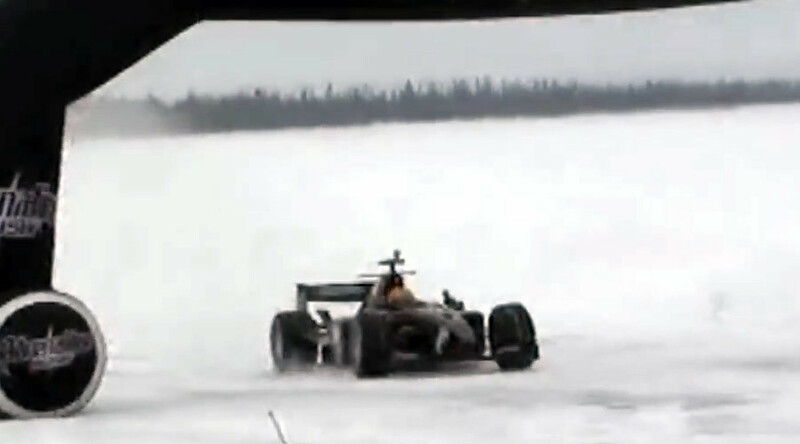 In 2000, Mika Hakkinen took a similar ride in a two-seated McLaren in Lapland.